A cappella singing requires finely tuned togetherness. To be fair, that's true of any live performance, be it dance, theater, burlesque or whatever. But the nakedness and vulnerability of voice-only music require an especially heightened level of focus and cohesion. It's like walking a tightrope sans net. You'll witness such vocal precision if you happen to catch Amerykanka in concert. The a cappella Eastern European folk ensemble — consisting of Rebecca Mack, Alison Mott, Salka Thali, Stephanie Heaghney and Audrey Pirog — performs music primarily derived from the Balkans. Through traditional harmonies and technique, Amerykanka summon a powerful, reverent atmosphere rich with history, cultural relevance and sonic complexity. The group showcases some of its growing repertoire of traditionals and originals — which spans the 12th century to present day — on the recently released debut album Snow. You can hear selections from the album and more when Amerykanka perform on Friday, December 21, at Radio Bean in Burlington. Led by Mack, a Burlington-based teaching artist, the group formed in early 2013, when Mott and Thali became the first inductees. Both Mack and Thali are members of Burlington's radical street band Brass Balagan, though Mack is on hiatus from that project. She enlisted Mott, a dancer, after hearing her sing to children at a local preschool. Heaghney and Pirog both belong to soulful jazz-pop outfit smalltalker. Several other members have come and gone since Amerykanka formed. Notably, Snow features vocals from Miku Daza, the mastermind behind the local ska-punk outfit of the same name; and Liana Nuse, who also plays cello on the record. Thali also plays clarinet. The members of Amerykanka — which means "American woman" in Bulgarian — sing in several languages: Judeo-Spanish, Yiddish, Czech, Bulgarian, Albanian, Latin and English. Mastering the nuances of so many tongues requires careful research and attention to detail. "We try to take it very seriously in terms of making sure that we're not mispronouncing," Mott says, noting that the challenge doesn't stop them from attempting a difficult piece. However, "Singing any language is very different from speaking it," Mack points out. "In terms of emphasis ... [In] French, all of the [unaccented letter] Es on the end of words are silent. But often singers in French will have a whole measure on an E [sound]." To assist with their Bulgarian language tunes, the group sought counsel from Bulgarian-born, New York City-based vocalist Vlada Tomova. (She's known for her work with Israeli band Balkan Beat Box, particularly on the tracks "Bulgarian Chicks" and "Meboli" from their 2005 debut, self-titled album.) Tomova has helped the group work on vocal tone, blending, rhythms and melismatic techniques specific to the music of the region. 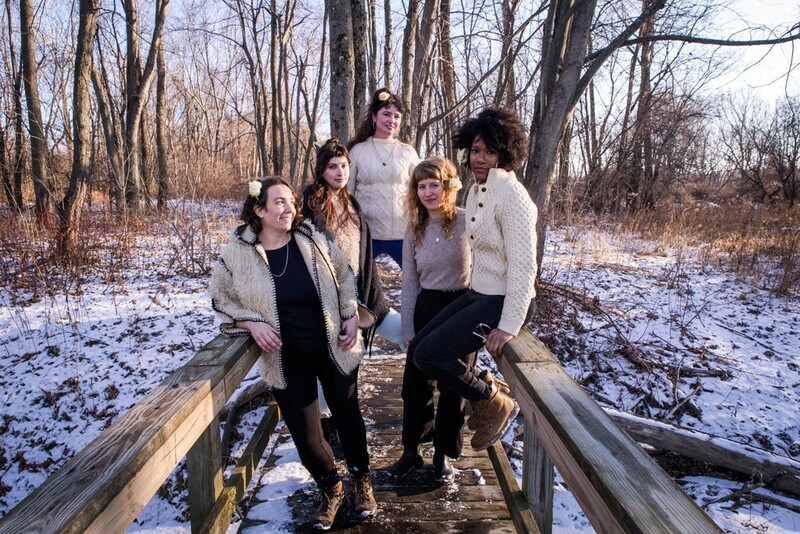 "We've worked on songs that are very village-style," Tomova tells Seven Days by phone. What is "village-style" singing? According to a 2004 article in the Anthropology of East Europe Review titled "The Mysterious Voice! American Women Singing Bulgarian Songs," by Jamie Lynn Webster, it "often means using an 'un-refined' or 'natural' voice with singers creating a melody with or without a drone based harmony." "It's kind of a sound that is not so easy to find nowadays — even in Bulgaria," Tomova says. "It's very earthy. It has a lot of overtones. It kind of creates a bodily experience. There's a specific resonance." Drones — continuous, one-note tones — are used as a foundation "to work around and bring out dissonance," says Thali. On Snow, tracks "Home" and "Snow" are stand-alone drones that also appear in and provide a foundation for "O Ignee Spiritus" and "Byla Cesta." "We don't have a backbeat," Mott says. "We have a drone instead." Amerykanka recorded Snow in Montréal with Burlington quasi-expat Ivan Klipstein, who's known for his indie-pop audiovisual project the Auroratones. With almost no assistance from pitch-correcting or vocal-augmenting software, the album has a raw sound. "I work with pretty old equipment," says Klipstein by phone. "It's more of an old-fashioned process. I try to boil it down to an essence as far as how the sound is captured." "There's a magical thing that happens when voices are together in space," says Mack. "[We make] sure that the actual quality of each voice is audible. It's a little different from when you're doing classical choral singing." Themes of womanhood and femininity frequently come up in the group's catalog of tunes. Audiences may not pick up on those themes without explicit descriptions, some of which Snow's liner notes offer. "Ajn Šnej, Mame," a Yiddish duet with Pirog and Mack, is stark and haunting, both in presentation and meaning. A song of lamentations, it tells the sad tale of a young woman who's been sent away from her family to work for a tailor. "It's rain-snowing outside, and she's just feeling very lonely and missing her mom," says Mott. "And she doesn't want to be there." "Mayn Rue Platz," which opens with solitary, plucked cello, is an ode to New York City's Triangle Shirtwaist Factory fire. The 1911 blaze resulted in the deaths of 146 people, most of whom were immigrant women under the age of 23. Though the group has only had female-identifying members so far, Mack says, "That's not a requirement for participating." Their arrangements could support lower voices, given that some of the pieces dip well into the tenor 2 range. Amerykanka are about to perform out of state for the first time. In January, they'll travel to Brooklyn to participate in the Zlatne Uste Golden Festival, the country's premier celebration of Balkan music and culture. The confluence of many like-minded artists inevitably leads to some crossover in terms of content. But Amerykanka strive to put their own spin on the traditionals they perform. "So many of these folk songs have been recorded so many ways," says Thali. "We wanted to make sure our [versions] were going to be slightly new." "One thing we can offer is bringing that music [to a new] context," says Mack. She refers to the venues where the band has performed: rock clubs. Similar acts typically lean more toward community centers and churches. But churches "sometimes can feel uncomfortable and make audience members feel uncomfortable," says Thali. Though Amerykanka performs some religious music, it considers such tunes from a historical perspective rather than a spiritual one. That's not to say that the singers operate without soul. They describe their rehearsals as deeply intimate and personal. "There's something in the experience, the intimacy of how your voice fits with another person," Tomova muses. "It's kind of like a dancing partner." The original print version of this article was headlined "Voices Carry"